Here are some tips to help you improve your dictation skills with Dual Writer. The Shared Speech Recognizer is not used by Dual Writer. You should turn it off while using the Dictation feature. Turn it back on when you want to use it to control Windows or other applications. If you are serious about using speech recognition, a good microphone is a must. Make sure that it is a USB microphone. USB gives you a higher quality input. A headset microphone is also a good choice, since it keeps the microphone a constant distance from your mouth. This seems like an obvious tip, but it takes practice. So make an effort to speak in a very clear, crisp manner like a newscaster. Try not to run your words together. Also, speak in a consistent, level volume. Speaking too loudly or too softly makes it difficult for the system to recognize what you’ve said. It’s best to work in a quiet environment, so that the computer hears you instead of the sounds around you. The Speech Recognition System can understand very long phrases and complete sentences without the need to pause. Speak in multiple word phrases as much as you can. It’s much harder for the system to understand single words than it is phrases. “Select the next three words.” You can edit very quickly by selecting with the mouse and using speech to replace the keyboard. Remember to turn off the Dictation feature or say “Stop listening” when you are not using it. Stray words can accidentally get entered into your document while Dictation is on. When dictating, finish a complete section of your work before going back and making corrections and formatting changes. Dictation is a great tool for getting your ideas on the page. Organizing and correcting are best left for the second draft. Just start talking and let the ideas flow. 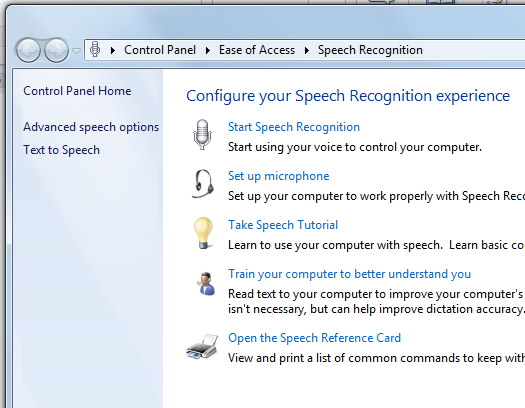 Learning to use the Speech Recognition System effectively takes some time to master. You will find that speaking your thoughts is a different experience than typing. You need to express your ideas in multiple words at a time, and say those words clearly and distinctly. Think about it as similar to learning to type. It’s not something you can instantly do. Ultimately, speaking is much faster and easier than typing, so the investment is worth the time and effort. And at the same time you are improving, the Speech Recognition System will also improve by learning your voice and the subjects you dictate. So practice, practice, practice. Don’t get discouraged. It takes time to get better. Dual Writer 1.0 Launches December 1, 2013! Dual Writer is a Windows word processor that incorporates Speech Recognition so you can type and talk to create your documents. Thank you for visiting the Dual Writer website!